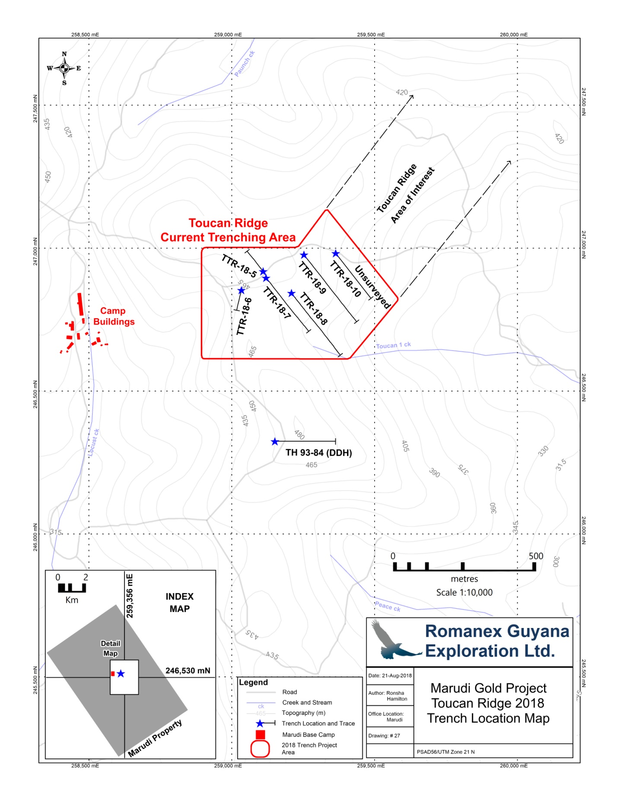 August 30, 2018 / TheNewswire / Vancouver, Canada - Guyana Goldstrike Inc. (the "Company" or "Guyana Goldstrike") (TSXV: GYA, OTC: GYNAF, FSE:1ZT) is pleased to report sampling and mapping of trench TTR-18-10 has been extended to 114 metres at the Toucan Ridge area on its Marudi Gold Project ("Marudi" or the "Property") located in the Guiana Gold Belt, Guyana, South America. 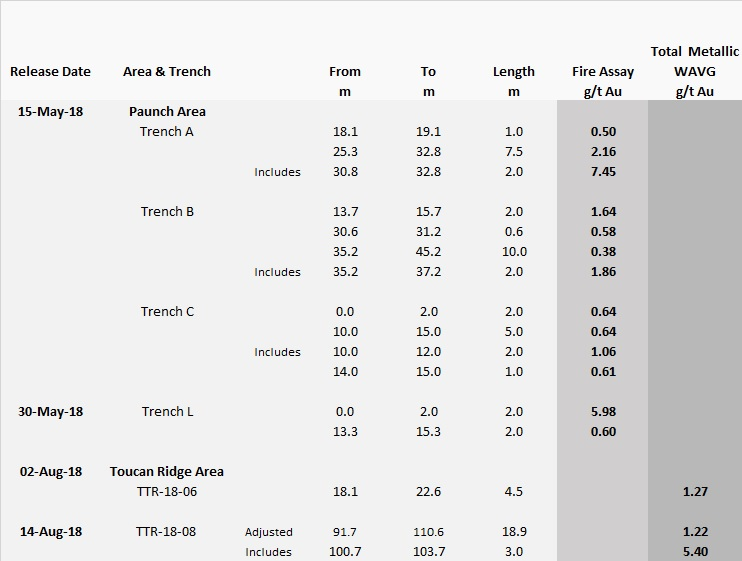 Trench TTR-18-10 is located approximately 400 metres eastward of trench TTR-18-06 along Toucan Ridge. To date, 114 metres has been trenched, sampled and mapped, with five sections identified as bearing quartzite-metachert host rock with magnetite. Trenching at TTR-18-10 continues. Trenching began on the western end with trench TTR-18-05 which is located approximately one kilometre east of the Marudi North zone and one kilomtetre north of the Mazoa Hill zone. The Mazoa Hill zone contains the project's current mineral resource estimate: 259,100 indicated gold ounces within 4,428,000 tonnes grading 1.8 g/t and 86,200 inferred gold ounces within 1,653,000 tonnes grading 1.6 g/t. Data analyzed suggests that the mineralized zone is open at depth and to the southeast. The Company has trenched four areas of interest: Paunch, Pancake, Marudi-North West Extension and Toucan Ridge, which is the current area of focus. In August 2018, samples at Toucan Ridge from trench TTR-18-8 returned initial assay values of 1.38 g/t gold over 16 metres including 5.4 g/t gold over 3 metres which has been subsequently adjusted to 1.22 g/t gold over 18.9 metres including 5.4 g/t over 3 metres. A total of 1112 metres of trenching has been completed in the Toucan Ridge area. 390 samples have been taken. The exploration team will continue along the ridge progressing in an eastward direction with each new trench site stepping out roughly 50-100 metre intervals, mainly perpendicular to the ridge. The area of interest continues for more than 1.75 kilometres to the east of the first trench - TTR-18-05. Trench sites are planned where quartzite-metachert is exposed or interpreted to occur beneath the transported overburden. The eastern part of Toucan Ridge is approximately 400 metres south of the Paunch area which was trenched in May and returned the Company's first significant gold discovery. The Company also announces that it will be proceeding with the grant of 1,500,000 incentive stock options announced on May 3rd, 2018, but that these options will be exercisable at a price of $0.30 and not $0.25 as previously noted. 150,000 of the options will vest in four equal increments every quarter for a period of 12 months, with the balance of the options vesting immediately. As announced, all the options will be exercisable for a period of sixty months.